DMCC, a leading free zone and Government of Dubai Authority on commodities trade and enterprise, has signed an agreement with China Council For The Promotion Of International Trade (CCPIT) for the promotion of global trade. 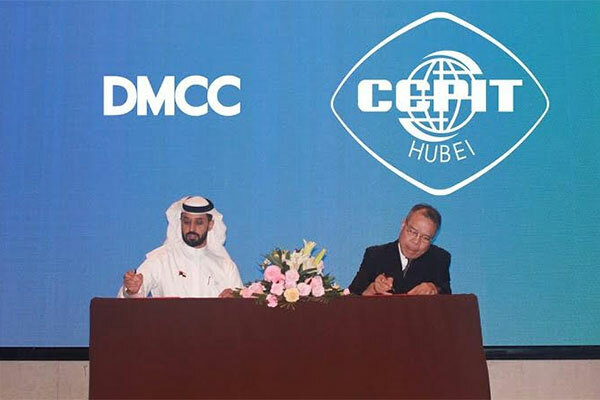 Designed to strengthen the commercial collaboration between the Hubei business community and DMCC, the memorandum of understanding (MoU) highlights Dubai’s position as a global gateway and the ideal partner for leading Chinese enterprise to access some of the fastest-growing markets in Central, South and South-East Asia, Europe, the Middle East, Africa and beyond. The agreement was unveiled during a ceremony staged at the Wanda Realm Wuhan hotel, in conjunction with CCPIT Hubai Province, and as part of DMCC’s latest Made for Trade Live event. The international roadshow is currently touring the Chinese cities of Wuhan, Beijing, Huangshi and Shanghai, to meet with senior business leaders and government officials and highlight the commercial opportunity presented by Dubai, through DMCC. “Signing this agreement represents a significant step forward in DMCC’s relationship with the Wuhan business community, and will only serve to strengthen the strong and longstanding economic ties between Dubai and China,” said Ahmed Bin Sulayem, executive chairman, DMCC. “The Made for Trade Live roadshow is a fantastic programme in that it enables DMCC to traverse the globe and communicate the commercial appeal of Dubai and the ease of doing business across a wide array of sectors. As the world’s economic gravity continues to shift eastwards, DMCC looks forward to supporting the strategic Dubai-China relationship, and enabling Chinese firms take advantage of its global connections, robust infrastructure and innovative business services,” he added. “CCPIT is thrilled to sign this MoU with DMCC and by doing so, promote the significant commercial opportunities available to Chinese companies in Dubai. We look forward to working alongside the world’s leading free zone and connecting the Wuhan business community to exciting growth markets through the global hub of Dubai,” Aiming Zhang, deputy chairman, CCPIT Hubei Province added. Made for Trade Live also profiles the 15,000 plus member companies in DMCC, including the growing number of leading Chinese firms such as Hisense; Hikvision; China Petroleum Engineering & Construction Corporation (CPECC); China Petroleum &Chemical Corporation (Sinopec); China Harbour Engineering Company, Power Construction Corporation of China and CHEMCHINA Chinese registrations have risen at an average annual growth rate of 46 per cent in the five years up to May 2018. The latest Made for Trade Live event is part of DMCC’s increasing engagement with China. Last year, DMCC’s Dubai Gold & Commodities Exchange (DGCX) was the first foreign exchange to list Shanghai Gold Futures (SGF) outside of China.